Security diversification refers to the allocation of a portfolio across different securities, so that no single security makes up too large a percentage of the portfolio. Sector diversification takes this idea one step further, making sure that the portfolio is distributed among multiple economic sectors. History has shown that limited security and/or sector diversification can result in significant portfolio volatility and can negatively affect a portfolio’s risk management profile. Events such as the bear market following the Nifty Fifty craze in the early 1970s, the internet bubble of the early 2000s following the technology boom of the late 1990s, and the financial crisis from 2007-2009 after years of outsized real estate growth and mortgage lending are all examples of supposed “can’t miss” investments whose eventual declines erased a great deal of shareholder wealth, especially for investors who overweighted these sectors/securities. Security diversification is important to all investors regardless of their investment objectives. How many securities must an investor hold to be adequately diversified? 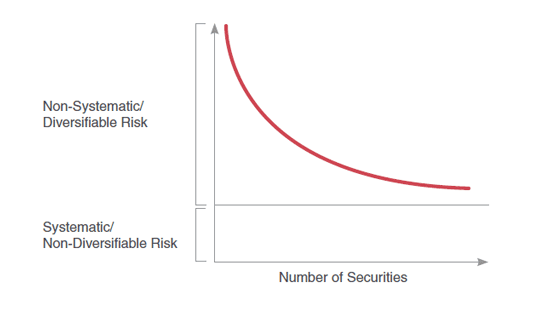 In order to gain a better understanding of this complex question, the graphic below displays the general relationship between risk and the number of securities in a portfolio. As illustrated above, adding securities to a portfolio reduces risk considerably, although there is a point where adding additional securities generally provides limited benefits. Exposure to an abundance of securities can potentially offset the benefits of the active fund manager’s investment decisions and may lead to index-like returns less the value-added fees charged by actively managed funds. In general, when a portfolio holds at least 20-30 distinct securities, non-systematic risk can be minimized. Non-systematic risk is sometimes referred to as random or diversifiable risk since it is related to unique factors specific to a particular company and/or the industry in which the company operates. The decline of Mattel stock1 during 2014 (i.e., from a price of $47.58 on 12/31/2013 down to $30.95 on 12/31/2014) as a result of consumers’ transition from Barbie dolls to more technoligically advanced toys, and the collapse of several of the Financial Services sector’s bellwethers in 2008 (e.g., Lehman Brothers, Bear Stearns, AIG) provide just a few examples of the potential non-systematic risk that can be reduced through diversification. Since incorporating exposure to multiple securities will help reduce random security specific risk, exposure to any one particular security should generally be limited to approximately 5% of a portfolio’s value. However, it is worth noting that you cannot eliminate all risk even by extensive security diversification. The risk that remains even after extensive security diversification is called systematic risk, or market/non-diversifiable risk. Likewise, sector diversification is an important issue to investors. In many cases, a portfolio that has security diversification concerns will also have sector diversification concerns. In other words, a portfolio concentrated in only a few holdings is also likely to be concentrated in a few economic sectors. However, investors should be aware that even though their portfolio may be adequately diversified at the security level, it is still possible to have concerns regarding limited sector diversification. In allocating such a significant portion of a portfolio to a single economic sector, there is a risk that any near-term weakness in the sector could result in significant volatility in the value of the portfolio. The chart on the following page highlights how overweights to different economic sectors can meaningfully affect a portfolio’s performance. Specifically, the chart depicts that the annual returns of the ten sectors of the S&P 5002 for each of the last five years varied meaningfully. For example, in 2014, the S&P 500’s2 best performing sector (i.e., Utilities at 28.98%) significantly outperformed the worst performing sector (i.e., Energy at -7.78%). Furthermore, even though all ten sectors were positive in 2010, 2012, and 2013, there was meaningful variability in returns across the sectors (i.e., returns range from just over 1% to over 43%). Clearly, incorporating diversification across multiple economic sectors improves a portfolio’s overall risk management profile and can reduce the likelihood of dramatic fluctuations in value. Finally, there have been instances where seemingly well-diversified market indexes have become concentrated in a single economic sector. For example, despite being cited as a diversified U.S. stock market index, Information Technology stocks comprised over 30% of the S&P 5002 at the end of 1999 and Financials grew to represent over 22% of the S&P 5002 by the end of 2006. Not surprisingly, these overweighted sectors contributed significantly to the S&P 500’s2 subsequent declines (i.e., the stock market experienced two of the worst bear markets in history in 2000 - 2002 and 2007 - 2009, led by these two sectors respectively). Analysis by Manning & Napier. Source: Bloomberg, Morningstar. ©2015 Morningstar. All Rights Reserved. The information contained herein: (1) is proprietary to Morningstar and/or its content providers; (2) may not be copied or distributed; and (3) is not warranted to be accurate, complete, or timely. Neither Morningstar nor its content providers are responsible for any damages or losses arising from any use of this information, except where such damages or losses cannot be limited or excluded by law in your jurisdiction. Past financial performance is no guarantee of future results. All data are subject to revision. 1The data presented is for informational purposes only. It is not to be considered a specific stock recommendation. 2The S&P 500 Total Return Index is an unmanaged, capitalization-weighted measure of 500 widely held common stocks listed on the New York Stock Exchange, American Stock Exchange, and the Over-the-Counter market. The Index returns assume daily reinvestment of dividends and do not reflect any fees or expenses. Index returns provided by Morningstar. S&P Dow Jones Indices LLC, a subsidiary of the McGraw Hill Financial, Inc., is the publisher of various index based data products and services and has licensed certain of its products and services for use by Manning & Napier. All such content Copyright © 2014 by S&P Dow Jones Indices LLC and/or its affiliates. All rights reserved. Neither S&P Dow Jones Indices LLC, Dow Jones Trademark Holdings LLC, their affiliates nor their third party licensors make any representation or warranty, express or implied, as to the ability of any index to accurately represent the asset class or market sector that it purports to represent and none of these parties shall have any liability for any errors, omissions, or interruptions of any index or the data included therein.